Gibson’s self-tuning Robot guitar had a limited run; the legendary guitar innovator had a much more insane second stage Robot already blueprinted and hidden up their sleeves. Of course, the mad scientists of Gibson Guitar’s don’t stop there, G-V readers, meet Gibson’s Dark Fire Les Paul digital guitar! Gibson continues to bring us more scientific achievements of our time. Acoustic Capabilities; bridge-mounted Gibson-designed piezo pickup that consists of six individual piezo pickups — one for each saddle/string. 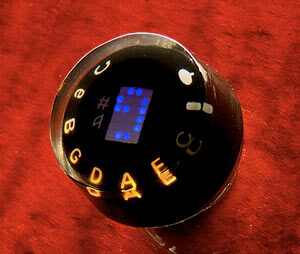 The BurstBucker 3 black humbucker in the bridge is slightly overwound with a hot output. 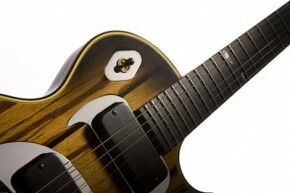 The P-90H black soapbar pickup is yet another example of Gibson’s drive to stay two steps ahead. 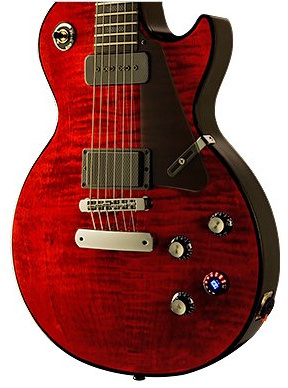 This pickup offers all of the soulful, classic tone of Gibson’s legendary P-90 singlecoil pickup (without the excessive 60-cycle hum) and delivers P-90’s vintage sonic characteristics. These three pickups provide capabilities to create their own distinctive, yet, original, organic blend of exceptional guitar flexibility and sounds. Having anchored itself firmly into Gibson Guitar traditional roots, the Dark Fire also incorporates some crazy new innovations. Like the Robot, the Dark Fire self-tunes (now up to 500 times per single battery charge), and using the “Chameleon Tone Technology” it is capable of producing “every imaginable guitar sound,” according to Gibson. 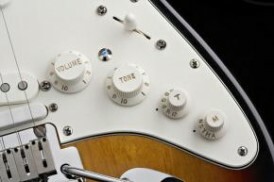 The company is especially pleased with the Master Control Knob (MCK) — designed so that turning the knob allows a very intuitive and significant change in tone—Dark Fire’s MCK control also allows you the ability to change the pickups and coils, and the ability to adjust each tone and tunings automatically and simultaneously, even during the same song that you are playing. Those who know of Les Paul’s compelling determination of guitar pioneering will greatly appreciate Gibson’s drive to carry on that legacy. Since 1939, Les Paul has paved the intricate path to invent necessary means for cooler guitar technology. Even today, some of Les’ personal guitars have a number of unmarked switches on them, not to mention a few unnamed stomp-boxes off to the side.